Early blog posts were a place to share my craftiness, but with most of my craft supplies still boxed up from an ongoing remodel, I haven’t had much to share about crafts. However, I have expanded my beekeeping posts because this has been the busiest year I’ve had as a keeper. I’d like to share some of what made this the oddest and most eventful year of beekeeping. See #4 on my list for details. 1. Winter. We had a very mild winter. Our one hive survived well and flourished enough to split. Or we caught a swarm that had overwintered and swarmed to our house. I think both happened. 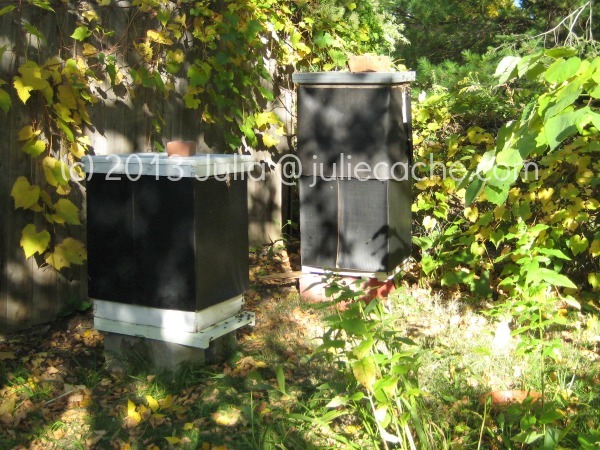 Regardless, I had some spare equipment available, so I now have two hives, which I have named Easton and Weston. (If you need more details, visit this post.) I definitely got some help from two local keepers. 2. Spring. We had a great beginning, then SNOW fell in May. Brand new keepers and new packages never had a chance, resulting in a flurry of traffic in my online support group for local keepers. I also spoke for the Iowa Chapter of the General Federation of Women’s Clubs, which I wrote about. 3. Calls for help. This may not be a complete list, but here are some of the calls for help that I got. Going from two calls per year to about ten is fairly crazy to me. A publishing company had a swarm. The gal said it was beautiful to experience the bees coming and going from their garden. A trapout from a tree. When a honeybee colony is too close for comfort, you might find a beekeeper who is available to move it for you. If you have a tree or house with a hive, please know that as long as the honeycomb remains accessible, bees will return to that location. I used expanding foam to cut off accessibility for this site, but bees have wood-chomping jaws. Tree removal is the best way to keep bees from returning. Another keeper ended up finishing this job for me; he filled a few good nucs from this tree. That was good, because I needed my equipment back home so I could deal with the bees in my own backyard (list item #1). A cutout from a house. Original story here. An established beehive should be removed from your house, no question about that. Good for you to know: I might take the bees and their comb away from your house, but I don’t repair the walls that I cut out. I have a gal in southern Iowa wrestling with this issue currently. If you are already need a new roof or siding, I’d love to coordinate with your contractor. Another cutout from a cinder block church-now-temple. (originally shared here) The owners were re-roofing. If I could have gotten to the colony from the roof, it would have worked. But since it was miles below the roof, I had no way to get all my equipment up there. Scaffolding would have been an excellent way to access the colony. I estimated that using ladders would have quadrupled my work time there. I don’t know if ladders would have even worked. Maybe it will work out next spring, because I have a feeling that the colony will survive the winter. Another tree. A trapout was not possible, and the gal has an in-home daycare. This colony had a history of surviving and splitting. The tree was going to be removed in the fall, she thought. But could I get the bees out now, in July? MidAmerican Energy. Two employees were stung, but not confirmed to be honeybee incidents. I may have to call her back and start a contractor and utility worker education class. Mis-identifications. Thankfully, we have digital zoom and email so I can identify honeybees before driving to a site. Several phone calls about non-bees came in. A storm. About a month ago, my city endured straight line winds. A coworker went for more than 24 hours without electricity. Old trees with honeybee colonies came down, including this one here. The bees are definitely racing against the calendar — had they come to us in May, I’d be happy about their progress. But it being October and all, I will exercise caution with my resources for these gals. Drake University. Professor seeks beeyard for her ten undergrads to visit. I sent this request this to my email group, where we also fielded a request for someone to speak to a Kiwanis club. A random phone call from someone who had a yellowjacket sting her three weeks ago. What? Am I listed as a medical expert on the internet? 4. My first bee equipment auction. My one support group (sorry, it has no internet presence) has an annual beekeeping equipment auction, and I could never attend. Until this year. I left with something I didn’t have on my very short shopping list — a winter hive cover. I use tar paper for the height that the cover cannot reach. 5. Consigning. With more than one beehive, I am able to supply some surplus to Sweetly Said, a local gift shop. This is my first year in a surplus situation. I’m hopeful that a family down the road will foster a beehive of mine next year. How has your year been? I’d love to know. This entry was posted in bees and tagged honeybees. Bookmark the permalink.